So you’re thinking about creating the next great culinary happening! Brad shares his journey from Chef to Food Entrepreneur – and invented Canada’s first Bacon Jam! So you’re romancing with the idea of owning your own restaurant, catering or cooking show! Yes the future world will still need Creative People in Food! So what do you need to be in the culinary business? Well, in addition to loving the culinary arts, and having some business acumen, you’ll need lots of passion, integrity and the ability to build and keep good relationships with people. Brad Smoliak shares his personal insights on how his journey as his early start as a chef under a great mentor at Normand’s, then to co-owner of the Hardware Grill. During his journey as a chef in the restaurant business, he pivoted to find balance for his family life, and discovered his niche and calling in culinary food product development. Yes the invention of Bacon Jam was his! Brad’s now taking the artisan of food creation by storm at Kitchen by Brad, a Culinary Studio in Edmonton Alberta, where you can join him to test drive your culinary passion in his cooking classes. Smoliak develops, tests, and brings to life new menus, recipes, and food products for restaurants, food manufacturers, and foodservice providers across North America, including Little Potato Company, Kitchen Partners, and Nestlé. With more than two decades experience as an executive chef, restaurant owner, and research chef, Smoliak is most proud to have been the Lead Consulting Chef for the Alberta Government in their promotional efforts at two Olympic Games: Vancouver 2010 and London 2012. 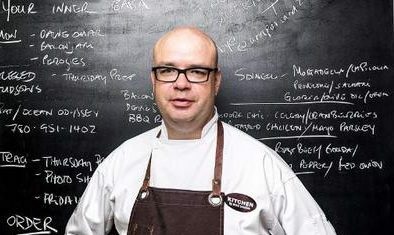 Before starting KITCHEN by Brad, Smoliak was executive chef of Normand’s Restaurant, Royal Mayfair Golf & Country Club, and co-founder of Hardware Grill in Edmonton. He has served on the board of directors and as chair for the Edmonton Downtown Farmers’ Market Association and cooked for Queen Elizabeth II of England when she visited Edmonton in 2005.